Over the last decade the amino acid beta-N-methylamino-L-alanine (BMAA) has come under intense scrutiny. International laboratory and epidemiological research continues to support the hypothesis that environmental exposure to BMAA (e.g., through dietary practices, water supply) can promote the risk of various neurodegenerative diseases. A wide variety of cyanobacteria spp. have previously been reported to produce BMAA, with production levels dependent upon species, strain and environmental conditions. Since spirulina (Arthrospira spp.) is a member of the cyanobacteria phylum frequently consumed via dietary supplements, the presence of BMAA in such products may have public health implications. In the current work, we have analyzed ten spirulina-containing samples for the presence of BMAA; six pure spirulina samples from two separate raw materials suppliers, and four commercially-available multi-ingredient products containing 1.45 g of spirulina per 8.5 g serving. Because of controversy surrounding the measurement of BMAA, we have used two complementary liquid chromatography-tandem mass spectrometry (LC-MS/MS) methods: one based on reversed phase LC (RPLC) with derivatization and the other based on hydrophilic interaction LC (HILIC). Potential matrix effects were corrected for by internal standardization using a stable isotope labeled BMAA standard. BMAA was not detected at low limits of detection (80 ng/g dry weight) in any of these product samples. Although these results are reassuring, BMAA analyses should be conducted on a wider sample selection and, perhaps, as part of ongoing spirulina production quality control testing and specifications. Over the last decade, an increasingly robust body of bench and epidemiological research has suggested that β-N-methylamino-L-alanine (BMAA) may play a role in various neurodegenerative diseases [1, 2]. BMAA is a non-proteinogenic amino acid first identified in the seeds of Cycas micronesia in 1967 . It was noted in the 1980s  and revisited again in 2002 , that cycad pulp and seed flour (as well as animals that fed upon cycad seeds) have been a significant part of the traditional dietary and medicinal agents among specific Western Pacific-dwelling communities (e.g. Guam). Based on experimental evidence of BMAA-induced neurotoxicity, these research groups theorized that a high incidence of neurodegenerative diseases in these regions may be associated with dietary intake of BMAA [4, 5]. Investigations would confirm that BMAA is found in various dietary items along the regional food chain within these communities and that BMAA can accumulate in animal tissue over time . Initially thought to be a relatively isolated concern traceable to the Cycas, and its seeds in particular, BMAA was reported in the brain tissue of a small sample of Canadian adults who had died in association with Alzheimer’s disease . BMAA was not found in controls that had died from causes other than neurodegenerative. This suggested that BMAA may not merely be a local concern for those in Micronesia. A 2003 report indicated that BMAA was being produced by cyanobacteria that live in symbiotic fashion with the Cycas roots . Subsequently, a study of 29 specific strains of free-living cyanobacteria (derived from marine, freshwater and brackish sources) showed that all but one produced BMAA . Since the strains of cyanobacteria used in the study were drawn from diverse taxa, and given the ubiquity of the phylum cyanobacteria itself, the implications to public health could be significant. Uncovering potential mechanisms of BMAA neurotoxicity is an area of intense research. Recent experimental studies indicate that BMAA induces oxidative stress and excitotoxicity, and the agent may be misincorporated into nerve cell proteins, causing neuronal damage [10, 11]. These studies are matched by emerging epidemiological work suggesting that residential proximity to cyanobaterial-contaminated lakes is associated with increased risk of amyotrophic lateral sclerosis (ALS) [12, 13]. Given the progress in this area, it is surprising that a significant source of direct cyanobacterial intake - spirulina-containing dietary supplements - have not been investigated for the presence or absence of BMAA. Within the Arthrospira genus of cyanobacteria, Arthrospira platensis is a dietary supplement commonly referred to as ‘spirulina’. Although spirulina is sold as a stand-alone supplement, it is frequently incorporated into so-called ‘green drink’ supplements, those inclusive of a variety of fruit, vegetable, herbal and aquatically-derived extracts in powdered form. The dose of spirulina within these supplements is usually significant, typically ranging between 1–2 grams per serving. Given that such supplements are marketed for continuous use, the presence of BMAA would be cause for legitimate concern. Although commonly referred to as a “blue-green algae”, and remarkably still remains technically classified as a botanical under the existing rules of the International Code of Nomenclature of Prokaryotes, spirulina actually belongs to the phylum Cyanobacteria and lack the nuclei of algae . We could find only a single published study, one conducted by Health Canada’s Bureau of Chemical Safety , which examined 11 “blue-green algae” containing food supplements for BMAA content. Using a liquid chromatographic method, the investigators found no BMAA to a detection limit of 200 ng/g. The researchers were able to recover up to 89% of BMAA when they intentionally spiked the supplements with BMAA, lending credibility to their findings. However, despite making note of the connection between BMAA and cyanobacterium spp. as a background to their investigation, within the methods section the group used only the broad term of “blue-green algae food supplements” and they did not specify species or provide a detailed description of the algae within the 11 products in question. It is unclear if the researchers were intending to examine spirulina, underscoring the need for proper nomenclature. Therefore, the presence/absence of BMAA in products specifically listing spirulina (or Arthrospira spp.) as an ingredient remains an open question. Furthermore, advanced analytical techniques have since allowed for improved detection of BMAA [16–20], including methodology that allows for the consideration of reactivity between BMAA and metal ions . Advanced techniques indicate that the broad assumption that all (or 90% plus) members of the cyanobacterial taxa are BMAA producers may be incorrect . Indeed, the most extensive review of the topic to date  has suggested that many of the assumptions related to the presence of BMAA in aquatic biosystems are based on a background of inadequate analytical methods and false positives. This same review highlights that liquid chromatography-mass spectrometry (LC-MS/MS) is currently regarded as the most suitable method to confirm the presence of BMAA and measure its concentration in samples. Still, to the best of our knowledge, researchers have not specifically looked for BMAA in edible spirulina samples. Given the international popularity of spirulina as a dietary supplement [24, 25], particularly in the context of “green drinks”, we have determined the BMAA content of ten spirulina samples using two LC-MS/MS methods. Our samples were comprised of six raw material samples of pure spirulina (derived from two separate suppliers) and four commercially available Canadian spirulina-containing dietary supplements. BMAA (β-N-methylamino-L-alanine hydrochloride, B107, 10 mg) was obtained from Tocris Bioscience (distributor: R&D systems, Minneapolis, MN), AEG (N-(2-aminoethyl)-glycine) was from TCI America chemicals (Portland, OR), and DAB (DL-2,4-diaminobutyric acid dihydrochloride, B3758, 1 g) was from Sigma Aldrich (Oakville, ON Canada). Ammonium formate (99%), sodium hydroxide, d3-methylamine hydrochloride, 2-acetamidoacrylic acid, and hydrochloric acid were purchased from Sigma Aldrich (Oakville, ON, Canada). Distilled-in-glass ethanol and methanol and HPLC grade acetonitrile were obtained from Caledon (Georgetown, ON, Canada) or BDH Inc. (Toronto, ON, Canada). Formic acid (>98% ACS grade) was obtained from EMD (Gibbstown, NJ, USA). The internal standard, d3-BMAA, was synthesized in-house following previously outlined procedures with some modifications [17, 26, 27]. In a round bottom flask a solution of d3-methyl amine hydrochloric acid (1 g in 4 mL of water) was cooled to 4°C. Sodium hydroxide (0.88 g) was added while stirring and the reaction was allowed to warm to room temperature. Then 2-acetamidoacrylic acid (0.37 g) was added and stirred without heat for 10 min. On a heating mantle the reaction temperature was brought to 35°C for 22 hr. After cooling to room temperature the mixture was dried using a rotary evaporator and the crude product was dissolved in a minimum volume of 3 M HCl and refluxed for 2 hr. The HCl was removed and the residue recrystallized from ethanol and water at 4°C. The resulting crystals were collected by filtration, washed with cold ethanol and dried. The structure of the product d3-BMAA was verified by NMR. Spirulina samples, ten in total, included six samples of raw spirulina furnished from two separate spirulina manufacturers, and four samples of multi-ingredient “green drink” products that were inclusive of 1.45 g of spirulina per serving. All samples were forwarded with commercial labels removed and coded as #1-10, i.e., all samples arrived to the NRC office as blind samples. The samples were stored at room temperature until analysis by LC-MS/MS. A positive control Cycad plant (Cycas debaoensis) was obtained from Jurassic Plants Nursery (Halfmoon Bay, BC). Leaves of the cycad plant were chopped into fine pieces using a scalpel and then freeze-dried in preparation for extraction and analysis. Bulk samples were thoroughly mixed and 10 mg aliquots were transferred to glass extraction tubes. A 20 μL aliquot of d3-BMAA internal standard was added to each sample and then 1 mL of 6 mM HCl was added and vortex mixed. The tubes were purged with nitrogen, covered with Teflon tape, capped and maintained at 110°C for 18 hr in order to determine “total BMAA”. When cool, the hydrolyzed sample extracts were filtered (0.22 μm Ultrafree-MC) and then dried under nitrogen at 55°C and reconstituted in 1.0 mL of 2 mM HCl. For RPLC the extracts were derivatized as described below. For HILIC a 100 μL aliquot of each filtered sample was dried under nitrogen and reconstituted in 100 μL of acetonitrile/water (65:35). AccQ-Tag kit reagent (Waters, Milford, MA, USA) was prepared according to the manufacturer’s instructions. For AQC derivatization, 40 μL of sample extract (dissolved in 2 mM HCl) was placed in a clean LC vial and dried thoroughly under a nitrogen stream at 55°C. The residue was reconstituted in 120 μL of AccQfluor borate buffer solution and vortex mixed. A 40 μL aliquot of AQC reagent solution was added and vortex mixed. The solution was allowed to sit at room temperature for 1 min and then heated at 55°C for 10 min before transfer to an LC insert vial for LC-MS/MS. Quantitative measurement of BMAA, DAB and AEG as AQC derivatives was performed using RPLC-MS/MS on an Agilent 1200 LC system (Agilent Inc., Palo Alta, CA) connected to an API4000 QTRAP mass spectrometer (AB Sciex, Concord, ON, Canada) using electrospray ionization and selected reaction monitoring. 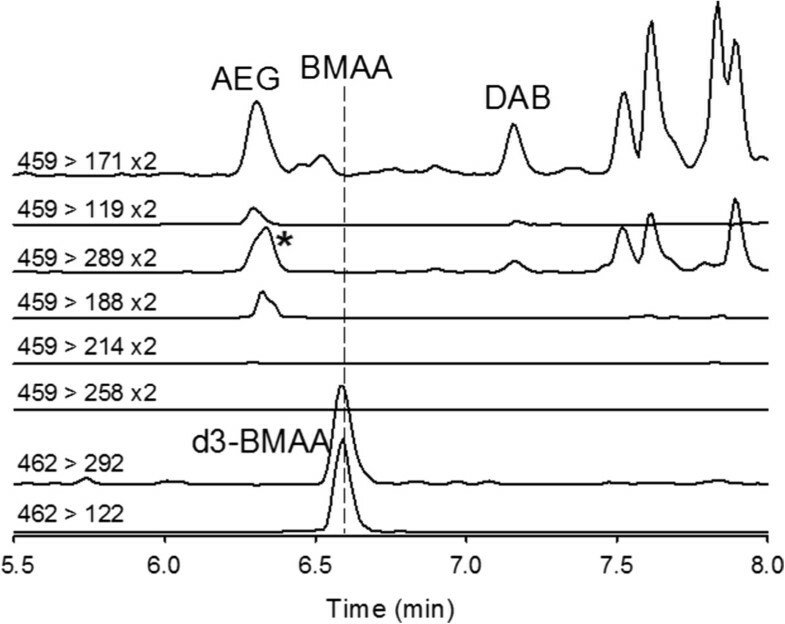 Direct quantitation of BMAA, DAB and AEG by HILIC-MS/MS on an Agilent 1100 LC system connected to an API 4000 mass spectrometer. Table 1 provides the experimental details for the two methods. 10-40% B in 6 min, to 85% B at 6.1 min, hold at 85% B until 8.5 min. 90 to 60% B in 15 min, hold to 20 min, decrease to 55% B at 21 min, hold to 30 min. Two complementary LC-MS/MS methods were used in the present study for the analysis of BMAA in hydrolysed spirulina-containing ‘green drink’ supplements with an extraction procedure aimed at providing “total BMAA” concentration, i.e., free plus protein-bound. One method was based on reversed phase LC (RPLC) with derivatization using 6-aminoquinolyl-N-hydroxysuccinimidylcarbamate (AQC) [16–19] and the other used hydrophilic interaction LC (HILIC) without derivatization . Two other compounds, 2,4-diaminobutyric acid (DAB) and N-(2-aminoethyl)-glycine (AEG), were also monitored since they are isomeric with BMAA and have been reported in cyanobacterial samples [19, 20]. A stable-isotope labeled internal standard, d3-BMAA, was used as internal standard in both methods to correct for extraction recovery and matrix effects, the latter being commonly observed in electrospray LC-MS/MS. Although better detection limits could have been achieved with solid phase extraction , such cleanup of samples was not used in this study because of concerns expressed in the literature  that BMAA might be lost during such procedures.Significant attention was paid to ensuring good separation of BMAA from isomeric compounds. There are many possible isomers of BMAA but the primary ones of concern are AEG and DAB. 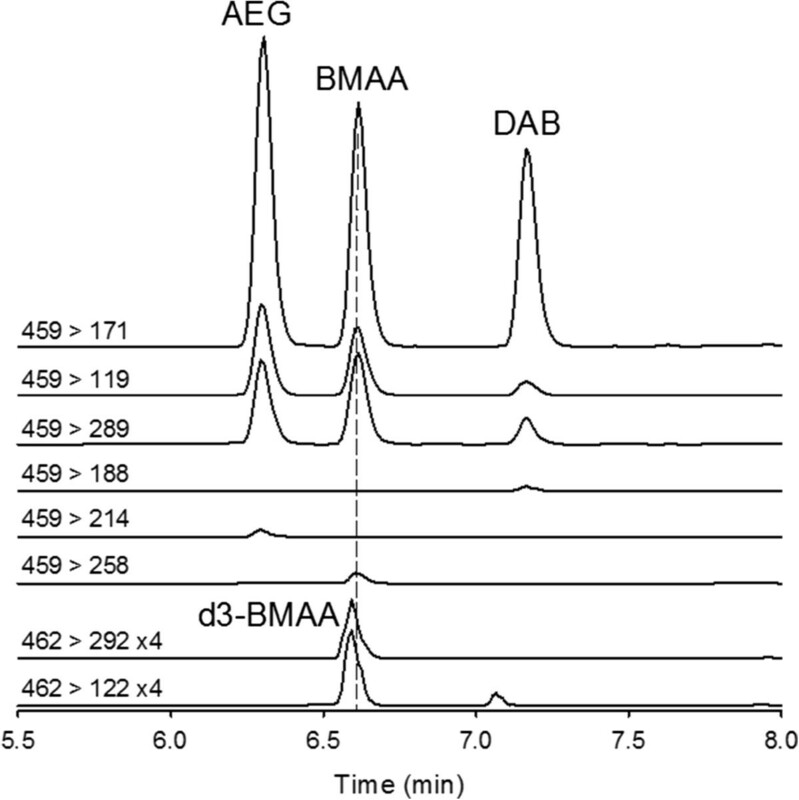 Good separations of BMAA from AEG and DAB were achieved in both RPLC and HILIC methods. Retention times for BMAA, AEG and DAB were 6.62, 6.31 and 7.17 min for RPLC (see Figure 1) and 18.46, 20.59 and 19.60 min for HILIC (data not shown), respectively. Target analytes were all baseline resolved as shown in Figure 1. The d3-BMAA internal standard eluted slightly earlier by 0.02 min than the unlabeled BMAA in RPLC and slightly later by 0.06 min in HILIC, but it was deemed that the peaks were sufficiently co-eluting in both methods as required for correction of matrix effects. Chromatograms from AQC-RPLC-MS/MS analysis of standards. The selected reaction monitoring (SRM) transitions used for detecting BMAA and its isomers compounds are detailed in the Methods section (Table 1). A total of 6 transitions were used for detecting BMAA, AEG and DAB, three of which were common to all compounds and three of which were selective to each compound (see Figure 1). Unfortunately, the compound specific signals were much weaker and are therefore only useful for higher levels. The ratios of the transition intensities as well as the retention times relative to d3-BMAA were used as criteria for identification of the compounds. Excellent linearity of response was observed for the two methods (R2 > 0.99). The limits of detection (LODs) were measured using calibration standards and were defined as the level at which there was a signal to noise ratio of 3. The LODs for the AQC-RPLC-MS/MS method were 80, 36 and 211 ng/g (dry weight) for BMAA, AEG and DAB, respectively. The corresponding LODs for HILIC-MS/MS were 93, 44 and 205 ng/g (dry weight). The absence of a signal for BMAA along with the presence of a signal for the d3-BMAA spike can be considered very good proof of absence (above the LOD) of BMAA in samples. The suitability of the two methods, from sample extraction through to analysis, was tested with a positive control: an extract of leaves from a Cycad plant (Cycas debaoensis) (data not shown), which, as previously discussed, is known to support cyanobacterium spp. that produce BMAA. BMAA was detected and confirmed to be present at ~220 μg/g (dry weight). Table 2 summarizes the results for the various samples analyzed. BMAA was not detected in any of the samples by either LC-MS/MS method. DAB and AEG were detected and confirmed in all samples at levels between 190 and 2600 ng/g (dry weight). Figure 2 shows a typical data set from the RPLC-MS/MS analysis of sample #7. No BMAA signal could be detected but signals for AEG, DAB and d3-BMAA were clearly observed at their correct retention times, which were very reproducible with less than 1% variation between samples. Measuring retention times relative to that of d3-BMAA allowed excellent matching (see Table 2). A number of peaks of unknown identity were observed at various retention times different than the target analytes, but are often only observed in one or two transition channels. This indicates the importance of using at least two, preferably three, SRM transitions for confirmation of compound identity. In this particular sample, a compound eluting close to AQC-derivatized AEG with a signal in the m/z 459 > 289 channel was observed at a low level (marked with an asterisk in Figure 2). We observed that this peak shifted its position relative to other peaks, sometimes approaching that of BMAA, when a new mobile phase batch with a slightly different pH was used. Analysis of the samples by the HILIC-MS/MS method were somewhat complicated by the effect of matrix on retention times, which shifted to earlier positions in the presence of matrix. Spikes of samples with BMAA confirmed, however, that d3-BMAA and BMAA still essentially co-eluted and the absence of a BMAA signal in samples could still be determined. This problem can be overcome with an SPE cleanup of the sample  and this will be used in future studies. *relative to d3-BMAA (RT = 6.60 min). **internal standard quantitation was used for BMAA, while external calibration. nd = not detected (LOD = 80 ng/g for BMAA). Retention times are expressed relative to a d3-BMAA internal standard that was spiked into the individual samples. Chromatograms from AQC-RPLC-MS/MS analysis of sample 7 spiked with 1 μ g/g d3-BMAA. Recorded use of spirulina for medicinal and dietary use dates back to the 16th Century . It has enjoyed a good degree of safety and a low risk of toxicity within the in vitro and in vivo models (although as mentioned, these have not addressed BMAA) . Amidst concerns related to cyanobacteria spp. and neurodegenerative diseases, it is worth pointing out that spirulina has been the subject of a number of studies related to the brain and nervous system, with outcomes demonstrating benefit even in models of developmental origins of health and disease [29–33]. For example, oral spirulina administration has been shown to protect against experimentally-induced neural tube defects  and spirulina-enhanced diets afford neuroprotection in experimental models of Parkinson’s disease . The anti-inflammatory and antioxidant properties of the agent in the context of neuroprotection have been well described . In 2011, the Dietary Supplements Information Expert Committee of the United States Pharmacopeial Convention (USP) reviewed human and experimental studies, as well as regulatory and pharmacopeial sources before assigning Spirulina maxima and Spirulina platensis a Class A safety rating. Thus, these primary forms of spirulina, those most commonly found in supplements, became part of the National Formulary of the USP, a compendia recognized by the United States Food, Drug, and Cosmetic Act. However, the Expert Committee of the USP did acknowledge that the unknowns related to spirulina and BMAA were a valid concern and should be incorporated into manufacturing quality controls . We agree. Indeed, although BMAA was not detected in any of the raw materials and finished product samples tested here, researchers have reported that BMAA production in various Cyanobacteria spp. is dependent upon nutrient availability and other environmental conditions . Therefore, in an effort to ensure consumer safety and following the precautionary principle regarding the emerging BMAA research, routine testing using techniques such as those outlined in the current study should be given wider consideration by spirulina harvesters as part of standard quality controls. Previous research using older methodology has suggested that species from a wide variety of cyanobacteria phyla are capable of producing the neurotoxin BMAA. International studies indicate that BMAA may accumulate in tissue over time, suggesting that the regular consumption of dietary products containing BMAA is of concern to public health. Spirulina is a cyanobacterium widely consumed as a dietary supplement. Moreover, spirulina has emerged as an attractive and nutritious component of animal feed ; therefore the opportunity for biomagnification of BMAA into the food supply, should it be present in spirulina, is strong. Although spirulina has been found to have neuroprotective properties in various models, it had not, to the best of our knowledge, been subjected to research for BMAA determination – perhaps due to the positive findings on its neurological benefits. Here, we have evaluated commercially available ‘green drink’ dietary supplements containing significant amounts of spirulina. Using two advanced LC-MS/MS techniques, we were unable to detect BMAA to a level of 80 ng/g in any of the product samples. Although reassuring, the small sample of pure spirulina and spirulina-containing retail products can only be considered as a preliminary step toward larger investigations and evaluation of quality control in spirulina production. In the often conflicting research surrounding the presence of BMAA in aquatic biosystems and products derived from fresh and marine waters, the use of LC-MS/MS is emerging as a gold standard with which to expand upon these discussions. The next steps should focus on inter-laboratory comparison studies and the production of certified reference materials for quality control of analyses. PM, SDG and MAQ report no conflicts of interest. ACL has received fees as an independent consultant for Genuine Health Inc, a manufacturer of dietary supplements containing spirulina. PM, SDG and MAQ conducted all physical research related to sample testing; ACL coordinated the research project and all authors provided equal input in the manuscript preparation. All authors have read and approved the final manuscript.